Microglia, the innate immune effector cells of the CNS parenchyma, express TLR that recognize conserved motifs of microorganisms referred to as pathogen-associated molecular patterns (PAMP). All TLRs identified to date, with the exception of TLR3, use a common adaptor protein, MyD88, to transduce activation signals. Recently, we reported that microglial activation in response to the Gram-positive bacterium Staphylococcus aureus was not completely attenuated following TLR2 ablation, suggesting the involvement of additional receptors. To assess the functional role of alternative TLRs in microglial responses to S. aureus and its cell wall product peptidoglycan as well as the Gram-negative PAMP LPS, we evaluated primary microglia from MyD88 knockout (KO) and wild-type mice. The induction of TNF-α, IL-12 p40, and MIP-2 (CXCL2) expression by S. aureus- and peptidoglycan-stimulated microglia was MyD88 dependent, as revealed by the complete inhibition of cytokine production in MyD88 KO cells. In addition, the expression of additional pattern recognition receptors, including TLR9, pentraxin-3, and lectin-like oxidized LDL receptor-1, was regulated, in part, via a MyD88-dependent manner as demonstrated by the attenuated expression of these receptors in MyD88 KO microglia. Microglial activation was only partially inhibited in LPS-stimulated MyD88 KO cells, suggesting the involvement of MyD88-independent pathways. Collectively, these findings reveal the complex mechanisms for microglia to respond to diverse bacterial pathogens, which occur via both MyD88-dependent and -independent pathways. Microglia, the resident innate immune effector cells of the CNS parenchyma, represent a first line of defense against invading CNS pathogens (1). As such, microglia are armed with an extensive repertoire of pattern recognition receptors (PRRs)3 including TLRs that are likely pivotal for maximizing pathogen detection (2). To date, the TLR family includes a total of 11 receptors that are responsible for the recognition of highly conserved structural motifs that are essential for pathogen survival and are conserved across broad subclasses of microorganisms (3, 4). These conserved microbial structural motifs are referred to as pathogen-associated molecular patterns (PAMPs), and at least one agonist has been identified for each TLR with the exception of TLR10. TLR2 recognizes the widest array of PAMPs in heterodimeric complexes with either TLR1 or TLR6, including lipoproteins and peptidoglycan (PGN) that are components of all bacteria possessing cell walls as well as lipoteichoic acid (LTA) from the cell wall of Gram-positive bacteria (4, 5). Our laboratory is interested in defining the signals responsible for microglial activation and subsequent induction of proinflammatory mediator expression in response to the Gram-positive bacterium Staphylococcus aureus, a prevalent CNS pathogen and frequent etiologic agent of brain abscess in humans (6, 7). Understanding the mechanisms by which Gram-positive bacteria engage CNS glia may lead to the development of novel therapeutic strategies aimed at attenuating inappropriate innate immune activation that has been associated with several CNS infectious diseases including bacterial meningitis and brain abscess (8, 9, 10, 11). Recent studies have established that microglia constitutively express TLR2 (12, 13, 14, 15, 16, 17, 18) (reviewed in Ref. 2). With regard to TLR2 Ags, as defined by studies investigating the functional importance of TLR2 in macrophage activation, microglia are capable of recognizing numerous TLR2 ligands including PGN, LTA, and tripalmitoyl-S-glycerylcysteine (Pam3Cys) (13, 16, 18, 19, 20, 21). Concerning the functional importance of TLR2 in microglial activation, our group was the first to report that this PRR plays an essential role in enabling PGN recognition using primary microglia isolated from TLR2 knockout (KO) and wild-type (WT) mice (18). Interestingly, microglial responses to the Gram-positive pathogen S. aureus were found to be largely TLR2 independent, with the majority of proinflammatory mediators examined in response to intact bacteria equivalently expressed in both TLR2 KO and WT cells, suggesting that microglia use alternative PRRs for S. aureus recognition (18). One possible candidate is TLR9 which recognizes nonmethylated CpG motifs that are prevalent in bacterial DNA (5). In addition, it is plausible that TLR1 and TLR6, both of which are expressed by microglia (13, 16), are sufficient to account for the residual proinflammatory mediator production observed in TLR2 KO microglia following bacterial stimulation (18). However, although several studies have defined the array of TLRs expressed on microglia (12, 16, 22, 23), a comprehensive assessment of the functional relevance of TLRs in enabling microglia to recognize PAMPs has not yet been performed. Therefore, the current study was designed to directly investigate the functional importance of multiple TLRs in mediating microglial activation through the use of primary microglia isolated from MyD88 KO and WT mice, where MyD88 represents a common adaptor protein required for signaling of all TLRs identified to date, with the exception of TLR3. Upon ligand binding, the intracellular portion of TLRs, referred to as the Toll/IL-1R (TIR) domain due to its similarity with the cytoplasmic domain of the IL-1R, initiates the TLR signaling cascade (24, 25). The TIR domain is highly conserved among all TLRs (with the exception of TLR3) and mediates its downstream signaling effects by interacting with the TIR-containing common adaptor protein MyD88. Interestingly, in addition to TLRs, both the IL-1 and IL-18 receptors also use MyD88 to transduce activation signals emanating from receptor ligation by their respective cytokines (26). Association of the TIR domain of MyD88 with that of TLRs recruits the serine/threonine kinase IL-1R-associated kinase (IRAK). Subsequently, IRAK is activated by autophosphorylation and dissociates from the receptor complex to interact with TNFR-associated factor-6. Consequently, the association of TNFR-associated factor-6 with IRAK leads to the activation of two distinct signaling pathways, namely the NF-κB and MAPK pathways. Both the NF-κB and MAPK pathways are capable of regulating the expression of numerous immune response genes including proinflammatory cytokines and chemokines (27). Several groups have demonstrated the importance of MyD88 in signaling through numerous TLRs either in MyD88 knockout mice (26, 28, 29, 30, 31) or through the expression of a mutant MyD88 protein that no longer is capable of transducing an activation signal (32, 33). However, the role of MyD88, and as an extension all TLRs, in enabling microglia to recognize and respond to PAMPs of clinical importance to CNS infectious diseases has not yet been examined. To determine the functional importance of multiple TLRs in S. aureus-dependent microglial activation, we evaluated the role of MyD88-dependent pathways using primary microglia isolated from MyD88 KO and WT mice. MyD88 gene KO mice (originally from Dr. S. Akira, Osaka University, Suita, Osaka, Japan) (26) were purchased from the Centre de La Recherche Scientifique and have been previously backcrossed with C57BL/6 mice for over 10 generations (29, 34). Primary microglia were isolated from MyD88 KO or WT C57BL/6 pups (Harlan Laboratories; 1–8 days of age) as previously described (35). The purity of microglial cultures was evaluated by immunohistochemical staining using Abs against CD11b (BD Pharmingen) and glial fibrillary acidic protein (DakoCytomation). The purity of primary microglial cultures was routinely >95%. Heat-inactivated S. aureus (strain RN6390, provided by Dr. A. Cheung, Dartmouth Medical School, Hanover, NH) was prepared as previously described (13). PGN derived from S. aureus was obtained from Fluka and Invivogen and Escherichia coli O11:B1 LPS was from List Biological Laboratories. Heat-inactivated S. aureus was used in these studies rather than live organisms to control the standard dosing of bacteria within and between individual experiments. Live organisms exhibit an extremely rapid doubling time (i.e., 5–10 min) that can quickly lead to culture overgrowth, medium exhaustion, and subsequent microglial death. Therefore, we elected to use heat-inactivated bacteria throughout the course of our studies to avoid these potentially confounding effects. All non-LPS reagents and culture medium were verified to have endotoxin levels <0.03 endotoxin units/ml as determined by Limulus amebocyte lysate assay (Associates of Cape Cod). In addition, a phosphate assay (Pierce) was performed on PGN stocks to ensure reagent purity since commercial PGN preparations have been reported to be contaminated with LTA and bacterial DNA (36), whereas PGN does not contain phosphate residues. The phosphate content of the PGN preparation used in this study was below the limit of detection, indicating that it was not contaminated with alternative microbial products. Unless otherwise indicated, heat-inactivated S. aureus (107 CFU/ml), PGN (10 μg/ml), and LPS (100 ng/ml) were added to microglial cultures at the final concentrations indicated, representing doses that were previously determined to be optimal for inducing maximal proinflammatory cytokine expression in microglia without any evidence of cytotoxicity (18, 35). In these studies, we used a multiplicity of infection of S. aureus to microglia of 50:1. In our in vivo model of brain abscess, bacterial titers reach 106- 107 CFU within the first 24 h following infection and continue to peak until day 5 (10, 37). When one considers the focal nature of brain abscess, and hence S. aureus localization in the brain parenchyma, and the fact that bacteria double in number every 5–10 min, the ratios of S. aureus:microglia used in our study are likely an underrepresentation of the actual pathogen burden that microglia would encounter in vivo. Comparisons in cytokine and chemokine expression between MyD88 WT and KO microglia were performed using standard sandwich ELISA kits according to the manufacturer’s instructions (OptEIA mouse TNF-α, IL-12 p40, IL-1β, and MCP-1/CCL2; BD Pharmingen; DuoSet mouse MIP-2/CXCL2; R&D Systems). The level of sensitivity for all ELISAs was 15.6 pg/ml. To confirm that the observed changes in inflammatory mediator expression between MyD88 WT and KO microglia were not due to differences in cell seeding densities or potential confounding proliferative effects, a standard MTT assay based on the mitochondrial conversion of MTT into formazan crystals was performed as previously described (35). Total RNA from MyD88 WT and KO microglia was isolated using the TRIzol reagent and treated with DNase1 (both from Invitrogen Life Technologies) before use in qRT-PCR studies. The experimental procedure was performed as previously described (18). Briefly, TLR2 and GAPDH primers and TAMRA TaqMan probes were designed as previously described (18, 38) and synthesized by Applied Biosystems. ABI Assays-on-Demand TaqMan kits were used to examine microglial IL-23 p19, TLR9, pentraxin-3 (PTX3), lectin-like oxidized low density lipoprotein receptor-1 (LOX-1), and nucleotide-binding oligomerization domain 2 (NOD2) expression. Comparisons in gene expression between MyD88 WT and KO primary microglia were calculated after normalizing cycle thresholds against the “housekeeping” gene GAPDH and are presented as the fold-induction (2−ΔΔCt, where Ct is the cycle threshold) value relative to unstimulated microglia. Protein extracts were prepared and quantitated from both MyD88 WT and KO microglia as previously described (35). The effects of heat-inactivated S. aureus, PGN, and LPS on microglial TLR2, MyD88, and inducible NO synthase (iNOS) protein expression were evaluated by Western blot analysis. Blots were probed using goat anti-mouse TLR2 (R&D Systems), rabbit anti-mouse MyD88 (eBioscience), or rabbit anti-mouse NOS2 (iNOS; Santa Cruz Biotechnology) Abs followed by the appropriate IgG-HRP conjugated secondary Abs (Jackson ImmunoResearch Laboratories). Blots were stripped and reprobed with a rabbit anti-actin polyclonal Ab (Sigma-Aldrich) for normalization. Blots were developed using the Immobilon Western substrate (Millipore) and visualized by exposure to x-ray film. Significant differences between experimental groups were determined by the Student t test at the 95% confidence interval using Sigma Stat (SPSS Science). The signal transduction pathways emanating from all of the TLRs identified to date, with the exception of TLR3, use the common adaptor protein MyD88 (28, 39, 40). Recently, we have shown that both S. aureus and its cell wall component PGN significantly increased TLR2 expression at both the mRNA and protein levels (18). In the present study, the effects of S. aureus and PGN as well as the Gram-negative bacterial cell wall product LPS, on MyD88 protein expression in primary microglia was evaluated by Western blotting. As shown in Fig. 1⇓, all three bacterial stimuli were found to enhance microglial MyD88 protein levels. As we had recently reported, TLR2 protein expression was elevated in response to S. aureus, PGN, and LPS in WT microglia (18, 38) (Fig. 2⇓). Interestingly, compared with WT microglia, constitutive TLR2 expression was extremely low and not induced in response to either S. aureus or PGN treatment in MyD88 KO cells (Fig. 2⇓). In contrast, LPS stimulation was capable of inducing TLR2 expression in MyD88 KO microglia (Fig. 2⇓). Collectively, these results suggest that MyD88 is pivotal for the induction of TLR2 protein expression in response to both S. aureus and PGN, which may serve to potentate microglial responses to Gram-positive pathogens through receptor up-regulation. In contrast, the induction of TLR2 expression in response to LPS occurs via a MyD88-independent pathway possibly via alternative adaptor proteins such as TIR domain-containing adaptor protein and TIR domain-containing adaptor inducing IFN-β (TRIF). MyD88 is induced in primary microglia in response to both Gram-positive and -negative bacterial stimuli. 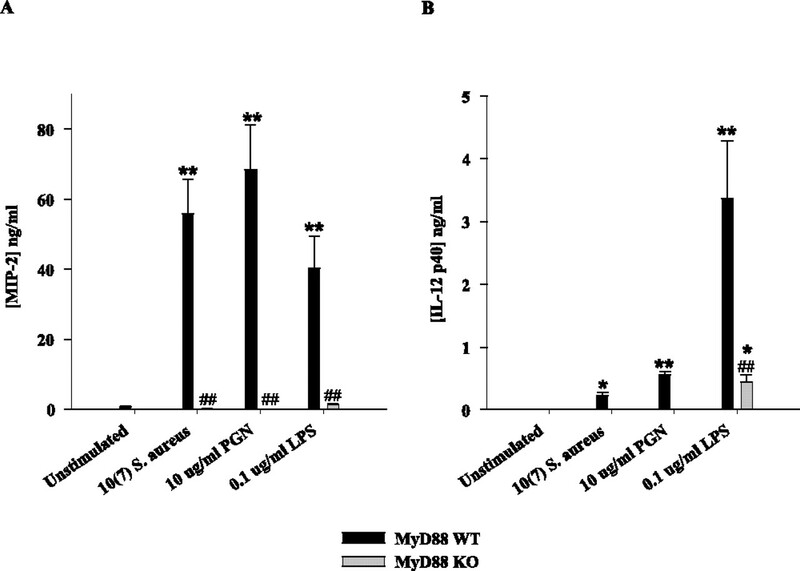 MyD88 KO and WT primary microglia were stimulated with either 107 heat-inactivated S. aureus, 10 μg/ml PGN, or 100 ng/ml LPS for 24 h, whereupon protein extracts from whole cell lysates (40 μg/sample) were evaluated for MyD88 expression by Western blotting as described in Materials and Methods. Following analysis, blots were stripped and reprobed with an Ab specific for β-actin to verify uniformity in gel loading. Results are representative of three independent experiments. LPS-induced TLR2 expression is regulated by a MyD88-independent pathway. MyD88 KO and WT primary microglia were stimulated with either 107 heat-inactivated S. aureus, 10 μg/ml PGN, or 100 ng/ml LPS for 24 h, whereupon protein extracts from whole cell lysates (40 μg/sample) were evaluated for TLR2 expression by Western blotting as described in Materials and Methods. Following analysis, blots were stripped and reprobed with an Ab specific for β-actin to verify uniformity in gel loading. Results are representative of three independent experiments. NO is a highly reactive free radical that performs a wide variety of cellular functions in addition to serving as an effective cytotoxic agent used by immune cells to inactivate pathogens (41). It is produced by any one of three enzyme isoforms termed NO synthases (NOS). Endothelial NOS and neuronal NOS occur constitutively and mediate vasodilation and neurosignaling, respectively. iNOS was first demonstrated in monocytes but is now known to be expressed in a variety of cell types, including microglia (42). iNOS expression is stimulated in glia by a variety of inflammatory cytokines and bacterial products including LPS. Although recent studies have implicated TLR4 in mediating the LPS-dependent production of reactive oxygen species in microglia (43), the question of whether MyD88-independent pathways are also involved and the role of MyD88 in mediating NO expression in response to Gram-positive bacterial stimuli has not yet been investigated. MyD88-dependent signals, presumably delivered via TLR4 engagement, were found to be pivotal for iNOS induction in LPS-stimulated microglia as reflected by a significant attenuation in iNOS levels in MyD88 KO microglia (Fig. 3⇓B). However, the residual iNOS expression detected in MyD88 KO cells indicated that MyD88-independent pathways are also involved. Interestingly, we could not detect iNOS protein expression in either S. aureus- or PGN-stimulated microglia suggesting that these bacterial stimuli are poor inducers of iNOS in primary microglia (Fig. 3⇓B). The inability to detect iNOS protein expression in response to S. aureus and PGN by Western blots may have resulted from limitations in the sensitivity of this technique. Therefore, we performed highly sensitive qRT-PCR analysis and were able to demonstrate that both S. aureus and PGN were capable of inducing iNOS mRNA expression in WT microglia. However, compared with LPS, the induction levels were very low, ∼20- to 30-fold less in S. aureus or PGN-stimulated cells compared with the former (Fig. 3⇓A). In addition, iNOS mRNA levels in response to both S. aureus and PGN were significantly attenuated in MyD88 KO microglia compared with WT cells (Fig. 3⇓A). Therefore, the reason(s) that iNOS protein could not be detected in primary microglia in response to S. aureus or PGN could be due to either sensitivity issues with Western blots and/or the fact that alterations in mRNA levels do not always necessarily extend to differences in protein expression. 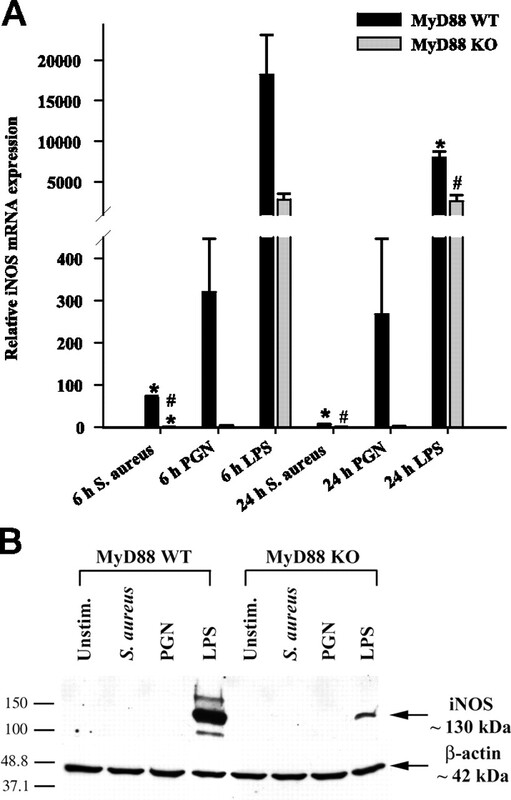 Role of MyD88-dependent signals in regulating iNOS expression. A, MyD88 KO and WT microglia were seeded at 2 × 106 cells/well in 6-well plates and incubated overnight. The following day, cells were stimulated with 107 heat-inactivated S. aureus, 10 μg/ml PGN, or 100 ng/ml LPS for 6 or 24 h, whereupon total RNA was isolated and examined for iNOS expression by qRT-PCR as described in Materials and Methods. Gene expression levels were calculated after normalizing iNOS signals against GAPDH and are presented in relative mRNA expression units (mean + SEM of three independent experiments). Significant differences in iNOS mRNA expression between unstimulated (data not shown) vs PAMP-treated microglia are denoted with asterisks (∗, p < 0.05), whereas significant differences between MyD88 KO vs WT microglia are denoted with a hatched sign (#, p < 0.05). B, MyD88 KO and WT primary microglia were stimulated with either 107 heat-inactivated S. aureus, 10 μg/ml PGN, or 100 ng/ml LPS for 24 h, whereupon protein extracts from whole cell lysates (40 μg/sample) were evaluated for iNOS expression by Western blotting as described in Materials and Methods. Following analysis, blots were stripped and reprobed with an Ab specific for β-actin to verify uniformity in gel loading. Results are representative of three independent experiments. Recently, we reported that TLR2 plays an important role in microglial recognition of PGN, whereas responses to intact S. aureus were primarily TLR2 independent because TLR2 ablation did not completely inhibit proinflammatory mediator production from S. aureus-stimulated microglia (18). Similar findings have also been reported in macrophages; however, macrophage activation was completely attenuated in response to S. aureus treatment in MyD88 KO cells, suggesting an important role for alternative TLRs (30, 31, 44). In the present study, an essential role for TLRs in S. aureus-dependent microglial activation was demonstrated. Specifically, TNF-α production was completely abolished in MyD88 KO microglia treated with PGN and minimal cytokine expression was detected in response to intact S. aureus only at the highest dose examined (Fig. 4⇓, A and B). In contrast, microglial TNF-α production in response to LPS was found to be mediated by both MyD88-dependent and -independent pathways (Fig. 4⇓C). Similar results were obtained for IL-1β (data not shown). Examination of chemokine expression in MyD88 KO and WT microglia revealed a similar requirement for MyD88 in response to S. aureus or PGN. Specifically, production of the potent neutrophil chemoattractant MIP-2/CXCL2 was completely attenuated in response to either S. aureus or PGN in MyD88 KO microglia compared with WT cells (Fig. 5⇓A). In addition, MyD88 KO microglia produced significantly lower levels of MIP-2/CXCL2 in response to LPS compared with WT cells (Fig. 5⇓A). Similar findings were observed for the monocyte/lymphocyte chemoattractant MCP-1/CCL2 (data not shown). Importantly, the concentrations of all bacterial stimuli used in this study did not adversely affect microglial cell viability, indicating that the attenuated responses of MyD88 KO microglia were not due to overt cell death or random differences in cell-seeding density (Fig. 4⇓D). 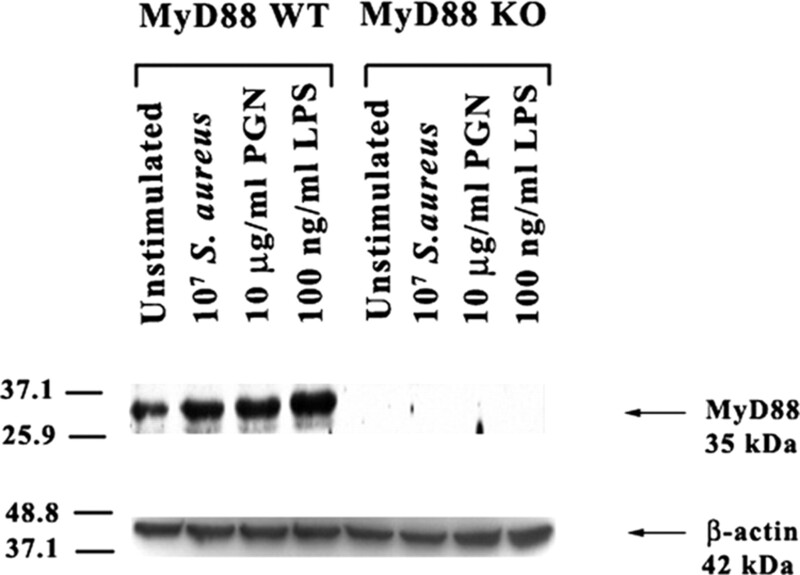 MyD88 is essential in mediating microglial activation in response to S. aureus and PGN. MyD88 KO and WT microglia were seeded at 2 × 105 cells/well in 96-well plates and incubated overnight. 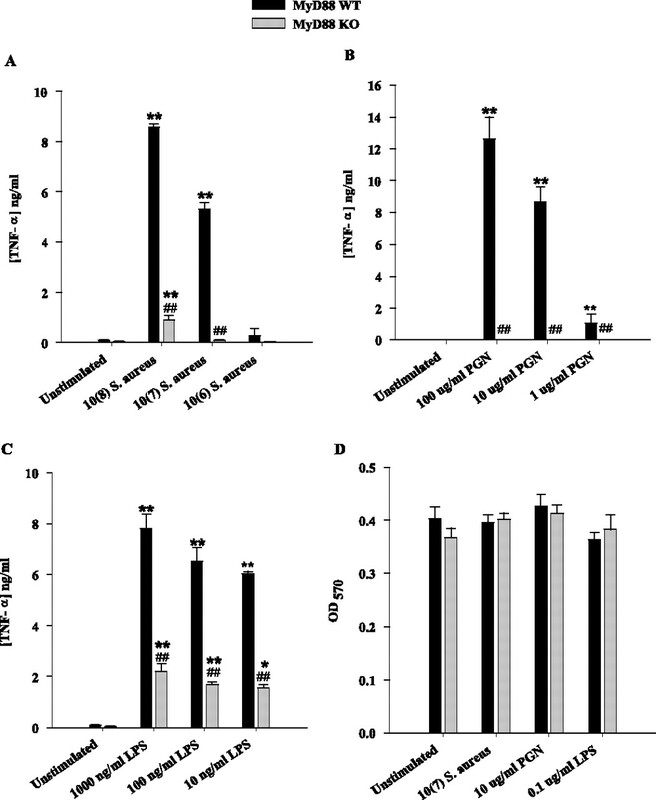 The following day, cells were exposed to various concentrations of heat-inactivated S. aureus (A), PGN (B), or LPS (C) for 24 h, whereupon conditioned supernatants were collected and analyzed for TNF-α protein expression by ELISA. Results are presented as the amount of TNF-α (nanogram) per milliliter of culture supernatant (mean ± SD). Microglial cell viability was assessed using a standard MTT assay and the raw OD570 absorbance values are reported (D; mean ± SD). Significant differences in TNF-α expression between unstimulated vs PAMP-treated microglia are denoted with asterisks (∗, p < 0.05; ∗∗, p < 0.001), whereas significant differences between MyD88 KO vs WT microglia are denoted with a hatched sign (##, p < 0.001). Results are representative of three independent experiments. The loss of MyD88 results in diminished MIP-2 and IL-12 p40 expression. Primary microglia from MyD88 KO and WT mice were seeded at 2 × 105 cells/well in 96-well plates and incubated overnight. The following day, cells were exposed to either 107 heat-inactivated S. aureus, 10 μg/ml PGN, or 100 ng/ml LPS for 24 h, whereupon conditioned supernatants were collected and analyzed for MIP-2 (A) and IL-12 p40 (B) protein expression by ELISA. Results are presented as the amount of cytokine (nanograms) per milliliter of culture supernatant (mean ± SD). Significant differences in cytokine expression between unstimulated vs PAMP-treated microglia are denoted with asterisks (∗, p < 0.05; ∗∗, p < 0.001), whereas significant differences between MyD88 KO vs WT microglia are denoted with a hatched sign (##, p < 0.001). Results are representative of three independent experiments. Recent studies from our laboratory have demonstrated that, unlike other proinflammatory cytokines examined, IL-12 p40 release was significantly increased in both S. aureus-stimulated TLR2 and CD14 KO microglia compared with WT cells (18, 38). Based on these results we had suggested that TLR2 signaling, potentially in cooperation with CD14, regulates IL-12 p40 release by inducing suppressor cytokines and/or activating a direct suppressor pathway. Recently, several reports have demonstrated the presence of numerous negative regulators of TLR signaling, most of which target the MyD88-dependent signaling cascade (45, 46). It is envisioned that the multimolecular complex formed by MyD88 following TLR signaling is an important target for some negative regulators and consequently affects the fine tuning of TLR responses (45). Indeed, in the present study we found that S. aureus stimulation was not capable of inducing IL-12 p40 production in MyD88KO microglia, similar to what was observed with PGN (Fig. 5⇑B). IL-12 p40 production was also attenuated in MyD88 KO microglia in response to LPS (Fig. 5⇑B). Therefore, it appears as if S. aureus activation of microglia induces a MyD88-dependent negative regulatory signal(s) that acts to attenuate the expression of select proinflammatory mediators such as IL-12 p40. Biologically active IL-12 consists of two subunits, p35 and p40, the latter of which is promiscuous in its ability to interact with other members of the IL-12 cytokine family (47). One such example is IL-23, which is composed of a unique p19 subunit and the common p40 subunit shared with IL-12 (48, 49). Although IL-12 and IL-23 share some overlapping activities in terms of their ability to impact T cell activation, IL-23 is unique in its ability to induce memory T cell proliferation (49, 50). Microglia have been reported to express IL-23 in response to IFN-γ and LPS stimulation (51, 52); however, the role of MyD88-dependent signals in regulating IL-23 levels has not yet been examined. To extend our analysis of cytokines associated with adaptive immunity, we evaluated the expression of IL-23 p19 mRNA in response to intact S. aureus, PGN, and LPS in MyD88 KO and WT microglia using qRT-PCR. All three bacterial stimuli were capable of eliciting IL-23 p19 expression in WT microglia; however, the induction of IL-23 p19 in response to S. aureus did not reach statistical significance (Fig. 6⇓). Although there was no induction of IL-23 p19 mRNA expression in MyD88 KO microglia in response to S. aureus, the differences between S. aureus-treated WT and KO cells was statistically insignificant (Fig. 6⇓A). Conversely, MyD88-dependent signals were found to be important for IL-23 p19 induction in response to both PGN and LPS (Fig. 6⇓, B and C). However, LPS was still capable of significantly augmenting IL-23 p19 mRNA expression in MyD88 KO microglia, suggesting that this cytokine is also influenced by MyD88-independent pathway(s). Collectively, these data demonstrate that MyD88 is essential for signaling the production of proinflammatory mediators in response to both S. aureus and PGN and as such, implicates the involvement of multiple TLRs in mediating maximal microglial activation in response to these Gram-positive stimuli. In contrast, LPS-induced microglial activation occurs via both MyD88-dependent and -independent pathways. MyD88 is involved in IL-23 p19 mRNA expression. MyD88 KO and WT microglia were seeded at 2 × 106 cells/well in 6-well plates and incubated overnight. The following day, cells were stimulated with either 107 heat-inactivated S. aureus (A), 10 μg/ml PGN (B), or 100 ng/ml LPS (C) for 6, 12, or 24 h, whereupon total RNA was isolated and examined for IL-23 p19 expression by qRT-PCR as described in Materials and Methods. Gene expression levels were calculated after normalizing IL-23 p19 signals against GAPDH and are presented in relative mRNA expression units (mean ± SEM of three independent experiments). Significant differences in IL-23 p19 mRNA expression between unstimulated vs PAMP-treated microglia are denoted with asterisks (∗, p < 0.05; ∗∗, p < 0.001), whereas significant differences between MyD88 KO vs WT microglia are denoted with a hatched sign (##, p < 0.001). Previous studies from our laboratory have revealed that both S. aureus and PGN modulate the expression of alternative PRRs in microglia, including the phagocytic receptors LOX-1 and PTX3 as well as TLR9 (18, 38). Because LOX-1 and PTX3 are considered phagocytic receptors and can directly bind pathogens (53, 54, 55), they may be responsible for S. aureus uptake by microglia. Although in general, engagement of phagocytic receptors does not directly lead to cytokine induction, these receptors are capable of influencing the activity of cytokine signaling receptors through receptor cross-talk. Therefore, we investigated the potential involvement of MyD88-dependent pathways on the modulation of phagocytic PRRs. The induction of microglial LOX-1 expression in response to all bacterial stimuli was time dependent, with maximal effects observed at 6-h poststimulation (Fig. 7⇓). MyD88 was found to play an important role in regulating microglial LOX-1 expression in response to S. aureus and PGN as evident by a reduction in LOX-1 levels in MyD88 KO cells; however, MyD88 did not appear to modulate microglial LOX-1 induction in response to LPS (Fig. 7⇓). A similar requirement for MyD88-dependent signaling on the induction of PTX3 expression was demonstrated by the failure of MyD88 KO microglia to up-regulate PTX3 levels (Fig. 8⇓). TLR9 recognizes bacterial DNA which contains high levels of unmethylated CpG motifs and this receptor uses a MyD88-dependent signaling pathway. Similar to what we have recently reported in primary microglia (18), TLR9 expression was attenuated in response to all three microbial stimuli examined; however, the inhibition resulting from S. aureus treatment did not reach statistical significance (Fig. 9⇓A). Interestingly, the level of PGN- and LPS-induced suppression of TLR9 expression was significantly less in MyD88 KO microglia compared with WT cells (Fig. 9⇓, B and C). Microglial LOX-1 expression is partially regulated by MyD88. MyD88 KO and WT microglia were seeded at 2 × 106 cells/well in 6-well plates and incubated overnight. The following day, cells were stimulated with either 107 heat-inactivated S. aureus (A), 10 μg/ml PGN (B), or 100 ng/ml LPS (C) for 6, 12, or 24 h, whereupon total RNA was isolated and examined for LOX-1 expression by qRT-PCR as described in Materials and Methods. Gene expression levels were calculated after normalizing LOX-1 signals against GAPDH and are presented in relative mRNA expression units (mean ± SEM of three independent experiments). Significant differences in LOX-1 mRNA expression between unstimulated vs PAMP-treated microglia are denoted with asterisks (∗, p < 0.05; ∗∗, p < 0.001), whereas significant differences between MyD88 KO vs WT microglia are denoted with a hatched sign (#, p < 0.05; ##, p < 0.001). The expression of PTX3 is regulated by MyD88 in primary microglia. MyD88 KO and WT microglia were seeded at 2 × 106 cells/well in 6-well plates and incubated overnight. The following day, cells were stimulated with either 107 heat-inactivated S. aureus (A), 10 μg/ml PGN (B), or 100 ng/ml LPS (C) for 6, 12, or 24 h, whereupon total RNA was isolated and examined for PTX3 expression by qRT-PCR as described in Materials and Methods. Gene expression levels were calculated after normalizing PTX3 signals against GAPDH and are presented in relative mRNA expression units (mean ± SEM of three independent experiments). Significant differences in PTX3 mRNA expression between unstimulated vs PAMP-treated microglia are denoted with asterisks (∗, p < 0.05; ∗∗, p < 0.001), whereas significant differences between MyD88 KO vs WT microglia are denoted with a hatched sign (#, p < 0.05; ##, p < 0.001). The loss of MyD88 results in differential expression of TLR9 mRNA expression in response to S. aureus, PGN, or LPS. MyD88 KO and WT microglia were seeded at 2 × 106 cells/well in 6-well plates and incubated overnight. The following day, cells were stimulated with either 107 heat-inactivated S. aureus (A), 10 μg/ml PGN (B), or 100 ng/ml LPS (C) for 6, 12, or 24 h, whereupon total RNA was isolated and examined for TLR9 expression by qRT-PCR as described in Materials and Methods. Gene expression levels were calculated after normalizing TLR9 signals against GAPDH and are presented in relative mRNA expression units (mean ± SEM of three independent experiments). Significant differences in TLR9 mRNA expression between unstimulated vs PAMP-treated microglia are denoted with asterisks (∗, p < 0.05; ∗∗, p < 0.001), whereas significant differences between MyD88 KO vs WT microglia are denoted with a hatched sign (#, p < 0.05; ##, p < 0.001). To expand our analysis of alternative PRRs in microglia, we evaluated changes in the expression of NOD2 in response to bacterial stimuli in MyD88 KO and WT microglia. NOD2 is a member of the nucleotide-binding oligomerization domain family of proteins and considered a PRR because it recognizes the bacterial product muramyl dipeptide (MDP), a degradation product of bacterial PGN (56, 57). A recent study has proposed that NOD2 could represent a negative regulator of TLR2-dependent signaling (58). However, to our knowledge the expression of NOD2 in microglia has not yet been reported. All three microbial stimuli tested were effective at augmenting microglial NOD2 expression (Fig. 10⇓). In addition, MyD88-dependent signal(s) were found to be important, in part, for regulating NOD2 levels as demonstrated by the attenuation of NOD2 expression in MyD88 KO microglia compared with WT cells (Fig. 10⇓). NOD2 mRNA is expressed in primary microglia. MyD88 KO and WT microglia were seeded at 2 × 106 cells/well in 6-well plates and incubated overnight. The following day, cells were stimulated with either 107 heat-inactivated S. aureus (A), 10 μg/ml PGN (B), or 100 ng/ml LPS (C) for 6, 12, or 24 h, whereupon total RNA was isolated and examined for NOD2 expression by qRT-PCR as described in Materials and Methods. Gene expression levels were calculated after normalizing NOD2 signals against GADPH and are presented in relative mRNA expression units (mean ± SEM of three independent experiments). Significant differences in NOD2 mRNA expression between unstimulated vs PAMP-treated microglia are denoted with asterisks (∗, p < 0.05; ∗∗, p < 0.001), whereas significant differences between MyD88 KO vs WT microglia are denoted with a hatched sign (#, p < 0.05). Collectively, these findings revealed that MyD88-dependent signaling pathways regulate, to varying extents, the expression of distinct PRRs including LOX-1, TLR9, PTX3, and NOD2. These findings reveal the complexity by which PRR expression is regulated in microglia. The establishment of an intricate set of signaling paradigms to augment PRR expression would ensure that the loss of a particular signaling pathway would not compromise microglial recognition of pathogens with potentially devastating effects on CNS integrity. Bacterial infections of the CNS continue to occur, despite advances made in detection and therapy. In addition, the emergence of multidrug-resistant strains of CNS pathogens, such as S. aureus, has become a confounding factor that is magnified by the inability of many antibiotics to reach high therapeutic levels in brain tissue. Therefore, understanding the mechanisms by which CNS bacterial pathogens are recognized by resident glia and infiltrating immune cells are critical toward the development of new therapeutic modalities for infection. The role of MyD88, the central adaptor molecule essential for signaling of the TIR family of receptors, has been examined in various systemic and CNS infections caused by a variety Gram-positive organisms including Streptococcus pneumoniae and S. aureus (31, 59, 60, 61). However, the functional importance of MyD88 in enabling the recognition of diverse bacterial motifs by microglia has not yet been evaluated. Therefore, in the present study, we examined the effects of S. aureus, a common etiological agent of brain abscesses, and the bacterial cell wall components PGN and LPS on the activation of MyD88 KO and WT microglia. Our results revealed that MyD88 is pivotal for microglial activation and subsequent proinflammatory mediator release in response to all three bacterial stimuli (S. aureus, PGN, and LPS). A recent publication has raised a debate as to whether PGN represents a true TLR2 ligand, a tenant that is supported by nearly 200 publications from various research groups. Specifically, Travassos et al. (36) reported that PGN is not recognized by TLR2 but instead by the intracellular PRR NOD2 because purified PGN was capable of activating NOD2-transfected, but not TLR2-transfected, HEK293 cells. However, in a recent study, Dziarski et al. (62) re-evaluated the effects of highly purified PGN on TLR2-transfected HEK293 cells and found that polymeric PGN is a potent TLR2 ligand, whereas muramidase treatment dramatically reduced the responsiveness of cells to PGN. Therefore, the authors suggested that various purification procedures could damage the cross-linked TLR2-activating structure of PGN which is required for TLR2, but not NOD activation. Our previous and current findings support the premise that PGN represents a TLR2 agonist in microglia, because we demonstrated that neither TLR2 nor MyD88 KO microglia were responsive to PGN (18). Importantly, the commercial PGN preparations used in this study were not found to contain detectable phosphate levels, indicating that any differences observed between MyD88 KO and WT microglia throughout this study cannot be explained by effects of contaminating LTA or DNA, which may be present in various commercial PGN preparations (36). In our previous studies, we demonstrated that microglial proinflammatory mediator production was not attenuated in either TLR2 or CD14 KO microglia following S. aureus stimulation, suggesting the activation of alternative receptors (18, 38). However, in the present work we have reported that cytokine/chemokine production in MyD88 KO microglia was nearly abolished in response to intact S. aureus. This finding directly implicates the functional involvement of additional TLRs due to the absence of this key adaptor molecule. Intact S. aureus presents microglia with a complex milieu of Ags including lipoproteins, PGN, and DNA-containing nonmethylated CpG motifs that serve as agonists for TLR1 and TLR6 (lipoproteins and PGN) and TLR9 (CpG DNA) (2). Both TLR1 and TLR6 form functional heterodimers with TLR2, which dictate ligand specificity to various bacterial lipoproteins (63, 64, 65). In addition, upon phagocytosis, endosomal degradation of pathogens leads to the exposure of bacterial DNA that can directly trigger activation signals via TLR9, which is an intracellular PRR (3, 66, 67, 68). We found that the ability of MyD88 KO and WT microglia to phagocytize S. aureus was equivalent (N. Esen and T. Kielian, unpublished observations), indicating that the failure of MyD88-deficient cells to produce proinflammatory mediators was not due to impaired access to bacterial Ags. Evaluation of TLR9 expression revealed that this TLR was regulated by both MyD88-dependent and -independent pathways, which was dependent on the type of stimulus used. Specifically, TLR9 levels were significantly different in PGN- and LPS-stimulated MyD88 KO microglia compared with WT cells, whereas TLR9 levels were equivalent in S. aureus-activated MyD88 KO and WT microglia. Recently, it has been reported that various forms of CpG DNA can activate dendritic cells differentially via TLR9-dependent and -independent signals (68). Specifically, conventional CpG DNA activated dendritic cells via a MyD88-dependent manner whereas a distinct CpG DNA, where polyG stretches are located at the 5′ and 3′ ends of a central CpG motif, induced IFN-α through IFN regulatory factor-3 (IRF-3) which did not require MyD88. Therefore, heterogeneity in the chemical composition of bacterial DNA may lead to activation of microglia via MyD88-dependent and -independent mechanisms; however, this possibility remains speculative. Finally, although every effort was made to ensure that endotoxin contamination of non-LPS reagents was not a confounding factor in our study, we cannot completely rule out the presence of minor LPS contaminants that were below the detection limit of our Limulus amebocyte lysate assay. Minor LPS contaminants may explain the low levels of residual cytokine expression observed in MyD88 KO microglia in response to S. aureus. Another possibility is that intact S. aureus may stimulate additional, as of yet unidentified, cytokine signaling PRRs that function independently of MyD88. It should be noted that there was no residual cytokine expression in PGN-treated MyD88 KO microglia, suggesting that this reagent did not contain trace amounts of LPS that could function via a MyD88-independent manner. Unlike proinflammatory cytokine production, which was nearly completely attenuated in MyD88 KO microglia in response to both S. aureus and PGN, the expression of alternative PRRs was not as affected by the loss of this TLR adaptor protein. For example, LOX-1 which has been reported to serve as a phagocytic receptor for S. aureus (55), was significantly increased in both MyD88 KO and WT microglia. In addition, the repeating carbohydrate moieties of PGN also make it a potential target for lectin-like molecules such as LOX-1 (69). Although it was evident, to a limited extent, that MyD88-dependent pathways were involved in regulating LOX-1 induction following PGN stimulation, in the majority of treatment conditions, microglial LOX-1 expression was equivalent in MyD88 KO and WT cells. These findings are similar to what we have previously reported in TLR2 KO microglia (18). The role of LOX-1 in microglial phagocytosis has not yet been examined; however, it is possible that LOX-1 is involved in bacterial uptake and subsequent processing, providing ligands to engage TLR9 to augment antibacterial immunity. Additional studies examining the functional significance of LOX-1 in microglial responses to bacteria are needed to assess its role in phagocytosis. We also examined the role of MyD88 in regulating the expression of the soluble PRR PTX3 in microglia. PTX3 expression was significantly enhanced following stimulation with either, S. aureus, PGN, or LPS in WT cells; however, PTX3 levels in MyD88 KO microglia were similar to baseline, indicating that MyD88-dependent signal(s) are critical for inducing the expression of this soluble PRR. This finding is in agreement with our previous report demonstrating that CD14-dependent signals, likely in cooperation with TLR2, are essential for maximal PTX3 expression in PGN-activated microglia (18, 38). NOD2 is an intracellular PRR that recognizes MDP moieties that are released as a result of hydrolytic or lysosomal digestion of PGN (56, 57). The interaction of NOD2 with MDP leads to NF-κB activation and subsequent proinflammatory gene expression (70). One interesting finding that surfaced during the course of these studies was the ability of all three bacterial stimuli examined to induce NOD2 expression in MyD88 KO and WT microglia. To our knowledge, this is the first report demonstrating the expression of NOD2 in primary microglia. We also observed that NOD2 levels were attenuated in response to both S. aureus and PGN, but not LPS, in MyD88 KO microglia, suggesting a role for MyD88-dependent signals in regulating the expression of this intracellular PRR. It is intriguing that NOD2 expression was found to be influenced, in part, by MyD88 in response to stimuli that harbor NOD2 ligands upon intercellular processing (i.e., PGN from the cell wall of intact S. aureus and PGN itself). The functional importance of NOD2 in mediating microglial activation and its role in the context of the myriad of PRRs expressed by microglia remain to be determined. LPS is a well-established TLR4 ligand and activates macrophages and dendritic cells via both MyD88-dependent and -independent pathways (3, 71, 72). Specifically, the induction of classical proinflammatory cytokines (i.e., TNF-α, IL-1β) by LPS is mediated via MyD88-dependent signals, whereas IFN-inducible genes such as iNOS, IFN-inducible protein 10, and IFNαβ are regulated via MyD88-independent pathways (29, 73). These IFN-inducible genes are controlled by the activation of two adaptor proteins, TIR domain-containing adaptor protein and TRIF, that act downstream to activate IRF-3 through Tank-binding kinase 1 and IκB kinase (74, 75). One interesting observation in the current study was the finding that LPS-induced proinflammatory cytokine expression was still evident in MyD88 KO microglia and although levels were significantly less compared with WT cells residual cytokine expression was still significantly elevated compared with unstimulated microglia. This finding differs from a study by Kawai et al. (29) where LPS-induced proinflammatory cytokine expression was abolished in MyD88 KO macrophages. The reason(s) responsible for these discrepancies are not known; however, our results suggest that proinflammatory cytokine production in microglia may be influenced by MyD88-independent signals, a finding which may be cell type specific. A recent study provides additional evidence to support our findings where LPS-stimulation was found to induce several chemokine and cytokine genes such as MIP-1α, MIP-1β, MIP-2, and TNF-α in MyD88-deficient cells as evaluated by microarray analysis (76). In addition, this study demonstrated that the TRIF-dependent pathway activated TNF-α production and secretion via a NF-κB-independent manner and suggested that secreted TNF-α acts in an autocrine manner to induce delayed NF-κB activation. Because depletion of IRF-3 was found to impair NF-κB activation, IRF-3 has been implicated as a mediator of TNF-α activation via a MyD88-independent pathway. In conclusion, our results indicate that microglial proinflammatory mediator release induced by the Gram-positive stimuli S. aureus and PGN occurs via a MyD88-dependent pathway and involves the activity of multiple TLRs. In addition, the expression of additional phagocytic PRRs, including LOX-1 and PTX3, is regulated, in part, by MyD88-dependent signals. In contrast, LPS-dependent microglial activation is regulated by both MyD88-dependent and -independent mechanisms. Moreover, we report the novel expression of the intracellular PRR, NOD2, in microglia and find that this receptor is augmented in response to Gram-positive bacteria and its cell wall product PGN. We are currently extending these studies to examine the role of MyD88 in S. aureus-dependent microglial activation in vivo using the experimental brain abscess model developed in our laboratory, where microglial responses will be quantified in FACS-purified populations from MyD88 WT and KO mice. Collectively, these results reveal the importance of MyD88, and by extension, multiple TLRs, in mediating microglial activation in response to a wide array of PAMPs. However, it is apparent that alternative PRRs also play a role in enabling maximal microglial responses to pathogens, which is not unexpected because bacteria such as S. aureus have the potential to elicit devastating consequences in a tissue that has limited regenerative capacity such as the CNS. We thank Patrick Mayes for excellent technical assistance. ↵1 This work was supported by the National Institutes of Health National Institute of Mental Health (RO1 MH65297) to T.K. and the National Institute of Neurological Disorders and Stroke-supported core facility at University of Arkansas for Medical Sciences (P30 NS047546). ↵3 Abbreviations used in this paper: PRR, pattern recognition receptor; PAMP, pathogen-associated molecular pattern; PGN, peptidoglycan; LTA, lipoteichoic acid; KO, knockout; WT, wild type; TIR, TLR/IL-1R; IRAK, IL-1R-associated kinase; qRT-PCR, quantitative real-time RT-PCR; PTX3, pentraxin-3; LOX-1, lectin-like oxidized low density lipoprotein receptor-1; NOD2, nucleotide-binding oligomerization domain 2; NOS, NO synthase; iNOS, inducible NOS; MDP, muramyl dipeptide; TRIF, TIR domain-containing adaptor inducing IFN-β; IRF-3, IFN regulatory factor-3. Aloisi, F.. 2001. Immune function of microglia. Glia 36: 165-179. Kielian, T.. 2006. Toll-like receptors (TLR) in central nervous system glial inflammation and homeostasis. J. Neurosci. Res. 83: 711-730. Kaisho, T., S. Akira. 2004. Pleiotropic function of Toll-like receptors. Microbes Infect. 6: 1388-1394. Kopp, E., R. Medzhitov. 2003. Recognition of microbial infection by Toll-like receptors. Curr. Opin. Immunol. 15: 396-401. Takeda, K., S. Akira. 2004. TLR signaling pathways. Semin. Immunol. 16: 3-9. Mathisen, G. E., J. P. Johnson. 1997. Brain abscess. Clin. Infect. Dis. 25: 763-779. 780–761. Townsend, G. C., W. M. Scheld. 1998. Infections of the central nervous system. Adv. Intern. Med. 43: 403-447. Koedel, U., W. M. Scheld, H. W. Pfister. 2002. Pathogenesis and pathophysiology of pneumococcal meningitis. Lancet Infect. Dis. 2: 721-736. Scheld, W. M., U. Koedel, B. Nathan, H. W. Pfister. 2002. Pathophysiology of bacterial meningitis: mechanism(s) of neuronal injury. J. Infect. Dis. 186: (Suppl. 2):S225-S233. Baldwin, A. C., T. Kielian. 2004. Persistent immune activation associated with a mouse model of Staphylococcus aureus-induced experimental brain abscess. J. Neuroimmunol. 151: 24-32. Bsibsi, M., R. Ravid, D. Gveric, J. M. van Noort. 2002. Broad expression of Toll-like receptors in the human central nervous system. J. Neuropathol. Exp. Neurol. 61: 1013-1021. Kielian, T., P. Mayes, M. Kielian. 2002. Characterization of microglial responses to Staphylococcus aureus: effects on cytokine, costimulatory molecule, and Toll-like receptor expression. J. Neuroimmunol. 130: 86-99. Laflamme, N., G. Soucy, S. Rivest. 2001. Circulating cell wall components derived from Gram-negative, not Gram-positive, bacteria cause a profound induction of the gene-encoding Toll-like receptor 2 in the CNS. J. Neurochem. 79: 648-657. Laflamme, N., H. Echchannaoui, R. Landmann, S. Rivest. 2003. Cooperation between Toll-like receptor 2 and 4 in the brain of mice challenged with cell wall components derived from Gram-negative and Gram-positive bacteria. Eur. J. Immunol. 33: 1127-1138. Olson, J. K., S. D. Miller. 2004. Microglia initiate central nervous system innate and adaptive immune responses through multiple TLRs. J. Immunol. 173: 3916-3924. Rasley, A., J. Anguita, I. Marriott. 2002. Borrelia burgdorferi induces inflammatory mediator production by murine microglia. J. Neuroimmunol. 130: 22-31. Kielian, T., N. Esen, E. D. Bearden. 2005. Toll-like receptor 2 (TLR2) is pivotal for recognition of S. aureus peptidoglycan but not intact bacteria by microglia. Glia 49: 567-576. Ebert, S., J. Gerber, S. Bader, F. Muhlhauser, K. Brechtel, T. J. Mitchell, R. Nau. 2005. Dose-dependent activation of microglial cells by Toll-like receptor agonists alone and in combination. J. Neuroimmunol. 159: 87-96. Chien, H. F., K. Y. Yeh, Y. F. Jiang-Shieh, I. H. Wei, C. Y. Chang, M. L. Chang, C. H. Wu. 2005. Signal transduction pathways of nitric oxide release in primary microglial culture challenged with Gram-positive bacterial constituent, lipoteichoic acid. Neuroscience 133: 423-436. Jung, D. Y., H. Lee, B. Y. Jung, J. Ock, M. S. Lee, W. H. Lee, K. Suk. 2005. TLR4, but not TLR2, signals autoregulatory apoptosis of cultured microglia: a critical role of IFN-β as a decision maker. J. Immunol. 174: 6467-6476. Lehnardt, S., L. Massillon, P. Follett, F. E. Jensen, R. Ratan, P. A. Rosenberg, J. J. Volpe, T. Vartanian. 2003. Activation of innate immunity in the CNS triggers neurodegeneration through a Toll-like receptor 4-dependent pathway. Proc. Natl. Acad. Sci. USA 100: 8514-8519. Lehnardt, S., C. Lachance, S. Patrizi, S. Lefebvre, P. L. Follett, F. E. Jensen, P. A. Rosenberg, J. J. Volpe, T. Vartanian. 2002. The Toll-like receptor TLR4 is necessary for lipopolysaccharide-induced oligodendrocyte injury in the CNS. J. Neurosci. 22: 2478-2486. Akira, S.. 2003. Toll-like receptor signaling. J. Biol. Chem. 278: 38105-38108. Akira, S., S. Sato. 2003. Toll-like receptors and their signaling mechanisms. Scand. J. Infect. Dis. 35: 555-562. Adachi, O., T. Kawai, K. Takeda, M. Matsumoto, H. Tsutsui, M. Sakagami, K. Nakanishi, S. Akira. 1998. Targeted disruption of the MyD88 gene results in loss of IL-1- and IL-18-mediated function. Immunity 9: 143-150. Hanada, T., A. Yoshimura. 2002. Regulation of cytokine signaling and inflammation. Cytokine Growth Factor Rev. 13: 413-421. Medzhitov, R., P. Preston-Hurlburt, E. Kopp, A. Stadlen, C. Chen, S. Ghosh, C. A. Janeway, Jr. 1998. MyD88 is an adaptor protein in the hToll/IL-1 receptor family signaling pathways. Mol. Cell 2: 253-258. Kawai, T., O. Adachi, T. Ogawa, K. Takeda, S. Akira. 1999. Unresponsiveness of MyD88-deficient mice to endotoxin. Immunity 11: 115-122. Takeuchi, O., K. Takeda, K. Hoshino, O. Adachi, T. Ogawa, S. Akira. 2000. Cellular responses to bacterial cell wall components are mediated through MyD88-dependent signaling cascades. Int. Immunol. 12: 113-117. Takeuchi, O., K. Hoshino, S. Akira. 2000. Cutting edge: TLR2-deficient and MyD88-deficient mice are highly susceptible to Staphylococcus aureus infection. J. Immunol. 165: 5392-5396. Underhill, D. M., A. Ozinsky, K. D. Smith, A. Aderem. 1999. Toll-like receptor-2 mediates mycobacteria-induced proinflammatory signaling in macrophages. Proc. Natl. Acad. Sci. USA 96: 14459-14463. Underhill, D., A. Ozinsky, A. M. Hajjar, A. Stevens, C. B. Wilson, M. Bassetti, A. Aderem. 1999. The Toll-like receptor 2 is recruited to macrophage phagosomes and discriminates between pathogens. Nature 401: 811-815. Fremond, C. M., V. Yeremeev, D. M. Nicolle, M. Jacobs, V. F. Quesniaux, B. Ryffel. 2004. Fatal Mycobacterium tuberculosis infection despite adaptive immune response in the absence of MyD88. J. Clin. Invest. 114: 1790-1799. Kielian, T., M. McMahon, E. D. Bearden, A. C. Baldwin, P. D. Drew, N. Esen. 2004. S. aureus-dependent microglial activation is selectively attenuated by the cyclopentenone prostaglandin 15-deoxy-δ12,14-prostaglandin J2 (15d-PGJ2). J. Neurochem. 90: 1163-1172. Travassos, L. H., S. E. Girardin, D. J. Philpott, D. Blanot, M. A. Nahori, C. Werts, I. G. Boneca. 2004. Toll-like receptor 2-dependent bacterial sensing does not occur via peptidoglycan recognition. EMBO Rep. 5: 1000-1006. Kielian, T., B. Barry, W. F. Hickey. 2001. CXC chemokine receptor-2 ligands are required for neutrophil-mediated host defense in experimental brain abscesses. J. Immunol. 166: 4634-4643. Esen, N., T. Kielian. 2005. Recognition of Staphylococcus aureus-derived peptidoglycan (PGN) but not intact bacteria is mediated by CD14 in microglia. J. Neuroimmunol. 170: 93-104. Wesche, H., W. J. Henzel, W. Shillinglaw, S. Li, Z. Cao. 1997. MyD88: an adapter that recruits IRAK to the IL-1 receptor complex. Immunity 7: 837-847. Burns, K., F. Martinon, C. Esslinger, H. Pahl, P. Schneider, J. L. Bodmer, F. Di Marco, L. French, J. Tschopp. 1998. 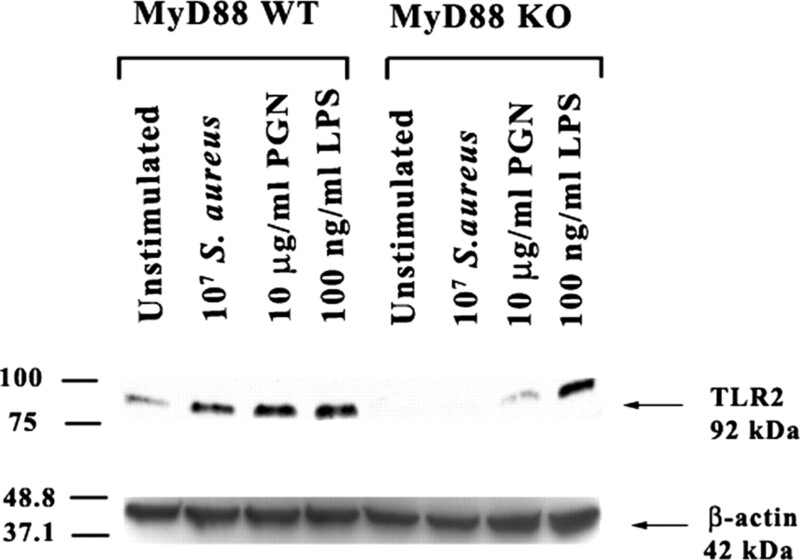 MyD88, an adapter protein involved in interleukin-1 signaling. J. Biol. Chem. 273: 12203-12209. MacMicking, J., Q. W. Xie, C. Nathan. 1997. Nitric oxide and macrophage function. Annu. Rev. Immunol. 15: 323-350. Lee, S. C., C. F. Brosnan. 1996. Cytokine regulation of iNOS expression in human glial cells. Methods 10: 31-37. Qin, L., G. Li, X. Qian, Y. Liu, X. Wu, B. Liu, J. S. Hong, M. L. Block. 2005. Interactive role of the Toll-like receptor 4 and reactive oxygen species in LPS-induced microglia activation. Glia 52: 78-84. Takeuchi, O., K. Hoshino, T. Kawai, H. Sanjo, H. Takada, T. Ogawa, K. Takeda, S. Akira. 1999. Differential roles of TLR2 and TLR4 in recognition of Gram-negative and Gram-positive bacterial cell wall components. Immunity 11: 443-451. Liew, F. Y., D. Xu, E. K. Brint, L. A. O’Neill. 2005. Negative regulation of Toll-like receptor-mediated immune responses. Nat. Rev. Immunol. 5: 446-458. Negishi, H., Y. Ohba, H. Yanai, A. Takaoka, K. Honma, K. Yui, T. Matsuyama, T. Taniguchi, K. Honda. 2005. Negative regulation of Toll-like receptor signaling by IRF-4. Proc. Natl. Acad. Sci. USA 102: 15989-15994. Langrish, C. L., B. S. McKenzie, N. J. Wilson, R. de Waal Malefyt, R. A. Kastelein, D. J. Cua. 2004. IL-12 and IL-23: master regulators of innate and adaptive immunity. Immunol. Rev. 202: 96-105. Watford, W. T., M. Moriguchi, A. Morinobu, J. J. O’Shea. 2003. The biology of IL-12: coordinating innate and adaptive immune responses. Cytokine Growth Factor Rev. 14: 361-368. Oppmann, B., R. Lesley, B. Blom, J. C. Timans, Y. Xu, B. Hunte, F. Vega, N. Yu, J. Wang, K. Singh, et al 2000. Novel p19 protein engages IL-12p40 to form a cytokine, IL-23, with biological activities similar as well as distinct from IL-12. Immunity 13: 715-725. Lankford, C. S., D. M. Frucht. 2003. A unique role for IL-23 in promoting cellular immunity. J. Leukocyte Biol. 73: 49-56. Li, J., B. Gran, G. X. Zhang, E. S. Ventura, I. Siglienti, A. Rostami, M. Kamoun. 2003. Differential expression and regulation of IL-23 and IL-12 subunits and receptors in adult mouse microglia. J. Neurol. Sci. 215: 95-103. Sonobe, Y., I. Yawata, J. Kawanokuchi, H. Takeuchi, T. Mizuno, A. Suzumura. 2005. Production of IL-27 and other IL-12 family cytokines by microglia and their subpopulations. Brain Res. 1040: 202-207. Garlanda, C., E. Hirsch, S. Bozza, A. Salustri, M. De Acetis, R. Nota, A. Maccagno, F. Riva, B. Bottazzi, G. Peri, et al 2002. Non-redundant role of the long pentraxin PTX3 in anti-fungal innate immune response. Nature 420: 182-186. Mantovani, A., C. Garlanda, B. Bottazzi. 2003. Pentraxin 3, a non-redundant soluble pattern recognition receptor involved in innate immunity. Vaccine 21: (Suppl. 2):S43-S47. Shimaoka, T., N. Kume, M. Minami, K. Hayashida, T. Sawamura, T. Kita, S. Yonehara. 2001. LOX-1 supports adhesion of Gram-positive and Gram-negative bacteria. J. Immunol. 166: 5108-5114. Netea, M. G., G. Ferwerda, D. J. de Jong, T. Jansen, L. Jacobs, M. Kramer, T. H. Naber, J. P. Drenth, S. E. Girardin, B. J. Kullberg, et al 2005. Nucleotide-binding oligomerization domain-2 modulates specific TLR pathways for the induction of cytokine release. J. Immunol. 174: 6518-6523. Girardin, S. E., I. G. Boneca, J. Viala, M. Chamaillard, A. Labigne, G. Thomas, D. J. Philpott, P. J. Sansonetti. 2003. Nod2 is a general sensor of peptidoglycan through muramyl dipeptide (MDP) detection. J. Biol. Chem. 278: 8869-8872. Watanabe, T., A. Kitani, P. J. Murray, W. Strober. 2004. NOD2 is a negative regulator of Toll-like receptor 2-mediated T helper type 1 responses. Nat. Immunol. 5: 800-808. Sugawara, I., H. Yamada, S. Mizuno, K. Takeda, S. Akira. 2003. Mycobacterial infection in MyD88-deficient mice. Microbiol. Immunol. 47: 841-847. Koedel, U., T. Rupprecht, B. Angele, J. Heesemann, H. Wagner, H. W. Pfister, C. J. Kirschning. 2004. MyD88 is required for mounting a robust host immune response to Streptococcus pneumoniae in the CNS. Brain 127: 1437-1445. Henneke, P., O. Takeuchi, R. Malley, E. Lien, R. R. Ingalls, M. W. Freeman, T. Mayadas, V. Nizet, S. Akira, D. L. Kasper, D. T. Golenbock. 2002. Cellular activation, phagocytosis, and bactericidal activity against group B Streptococcus involve parallel myeloid differentiation factor 88-dependent and independent signaling pathways. J. Immunol. 169: 3970-3977. Dziarski, R., D. Gupta. 2005. Staphylococcus aureus peptidoglycan is a Toll-like receptor 2 activator: a reevaluation. Infect. Immun. 73: 5212-5216. Takeuchi, O., S. Sato, T. Horiuchi, K. Hoshino, K. Takeda, Z. Dong, R. L. Modlin, S. Akira. 2002. Cutting edge: role of Toll-like receptor 1 in mediating immune response to microbial lipoproteins. J. Immunol. 169: 10-14. Takeuchi, O., T. Kawai, P. F. Muhlradt, M. Morr, J. D. Radolf, A. Zychlinsky, K. Takeda, S. Akira. 2001. Discrimination of bacterial lipoproteins by Toll-like receptor 6. Int. Immunol. 13: 933-940. Omueti, K. O., J. M. Beyer, C. M. Johnson, E. A. Lyle, R. I. Tapping. 2005. Domain exchange between human Toll-like receptors 1 and 6 reveals a region required for lipopeptide discrimination. J. Biol. Chem. 280: 36616-36625. Akira, S., H. Hemmi. 2003. Recognition of pathogen-associated molecular patterns by TLR family. Immunol. Lett. 85: 85-95. Hemmi, H., O. Takeuchi, T. Kawai, T. Kaisho, S. Sato, H. Sanjo, M. Matsumoto, K. Hoshino, H. Wagner, K. Takeda, S. Akira. 2000. A Toll-like receptor recognizes bacterial DNA. Nature 408: 740-745. Hemmi, H., T. Kaisho, K. Takeda, S. Akira. 2003. The roles of Toll-like receptor 9, MyD88, and DNA-dependent protein kinase catalytic subunit in the effects of two distinct CpG DNAs on dendritic cell subsets. J. Immunol. 170: 3059-3064. Gordon, S.. 2002. Pattern recognition receptors: doubling up for the innate immune response. Cell 111: 927-930. Inohara, N., M. Chamaillard, C. McDonald, G. Nunez. 2004. NOD-LRR proteins: role in host-microbial interactions and inflammatory disease. Annu. Rev. Biochem. 74: 355-383. Akira, S., M. Yamamoto, K. Takeda. 2003. Role of adapters in Toll-like receptor signalling. Biochem. Soc. Trans. 31: 637-642. Takeda, K., T. Kaisho, S. Akira. 2003. Toll-like receptors. Annu. Rev. Immunol. 21: 335-376. Lee, J. Y., C. A. Lowell, D. G. Lemay, H. S. Youn, S. H. Rhee, K. H. Sohn, B. Jang, J. Ye, J. H. Chung, D. H. Hwang. 2005. The regulation of the expression of inducible nitric oxide synthase by Src-family tyrosine kinases mediated through MyD88-independent signaling pathways of Toll-like receptor 4. Biochem. Pharmacol. 70: 1231-1240. Akira, S., K. Hoshino. 2003. Myeloid differentiation factor 88-dependent and -independent pathways in toll-like receptor signaling. J. Infect. Dis. 187: (Suppl. 2):S356-S363. Kawai, T., O. Takeuchi, T. Fujita, J. Inoue, P. F. Muhlradt, S. Sato, K. Hoshino, S. Akira. 2001. Lipopolysaccharide stimulates the MyD88-independent pathway and results in activation of IFN-regulatory factor 3 and the expression of a subset of lipopolysaccharide-inducible genes. J. Immunol. 167: 5887-5894. Covert, M. W., T. H. Leung, J. E. Gaston, D. Baltimore. 2005. Achieving stability of lipopolysaccharide-induced NF-κB activation. Science 309: 1854-1857.